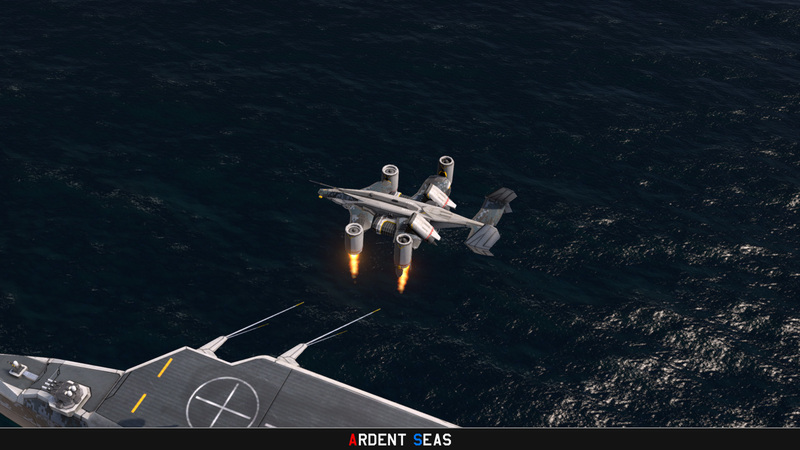 Ardent Seas blends modern naval combat with classical RTS gameplay, featuring Aliens, space lasers, and unholy amounts of missiles. Flagships, enormous floating command centers, can produce some of the ships, but larger ones, like Battleships and Carriers are built in Shipyards. 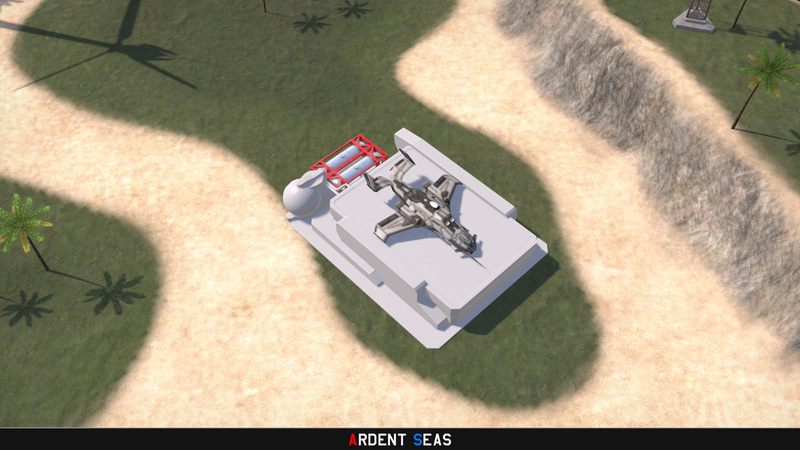 It also acts as floating tech lab, where new units, upgrades and abilities are unlocked. Shipyards are built on conquerable Islands spread around the maps, along with other types of structures. 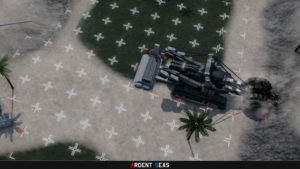 Such as refineries, that increase the mining yield of harvesting units. Also airfields, that allow the production and maintenance of extra aircraft. 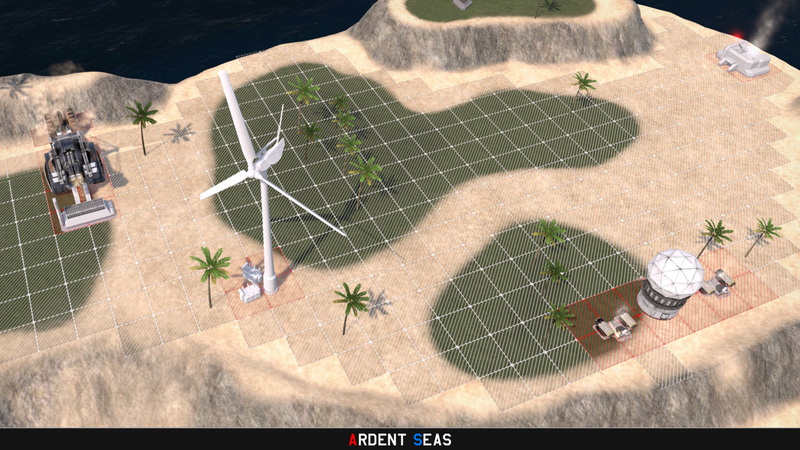 And defensive installations, to keep the Islands and nearby friendly ships safe. 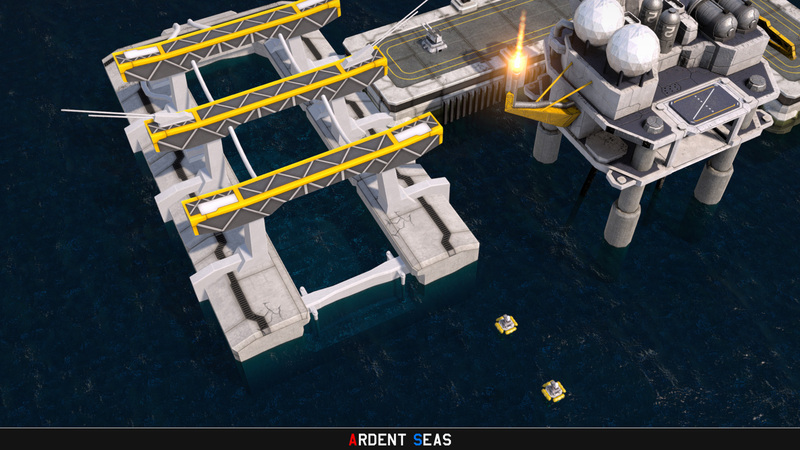 Resources are mined by extractor-structures: Ore extractors on land, and Hydrocarbon extractors in coastal waters. Resource deposits vary in mining yield: Rich, Moderate, Poor and Depleted, each producing half as many resources as the previous one, and decaying over time. 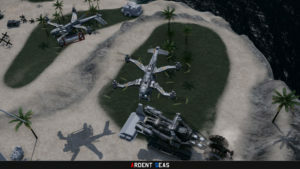 The game features three unique factions. The Tenorran Defense Navy, TDN for short, the Coalition Navy, commonly shortened as CN, and the Ravagers. The Tenorran Defense Navy are the Naval branch of the Tenorran Union, a federal union of advanced nations. In true modern navy style, their units are fast, and primarily use missiles as weapons, as well as electronic warfare. The fight at long range, but their range comes at the cost of armor. Their biggest strength is their powerful air force. Slower, but very well armored, is the Coalition Navy. a multinational navy part of the Coalition of Populist Socialist Nations, the second major power on the planet. Their ships trade mobility and range for armor and firepower. Their Submarine fleet is unrivaled, and their ships are more reliant on large cannons than missiles. The Ravagers are an armada of drones of unknown origin. Their units are extremely fast, and have shields to protect their comparatively weak armor. They fight at very short ranges, where their ships can put their high damage potential to use. Ardent Seas takes place on the planets of Pyrios and Tenorra, two Earthlike ocean planets in the same binary star system. Pyrios orbits an unusually calm Red Dwarf, and is a recently established colony of the inhabitants of Tenorra. Tenorra is somewhat bigger than Earth, but with less landmass, and orbits an F5V class Star. It was colonized some centuries ago by Humans from Earth, and has gone through a short dark age since then. The planets are under attack by the Ravagers, and it will be on you to fend them off. Arrr, me hearties! I can't say that out loud. That sounds horrible. Cursed german accent! Where were we? Ah, yes. Base building. Let's get right to it! I have to say in advance that most of what you see here is not yet fully implemented, but everything will look and work almost exactly as described. "Oi! I thought the Flagship did everything! ", you might say, and you wouldn't be entirely wrong. The Bases basically do everything Flagships do, except better. 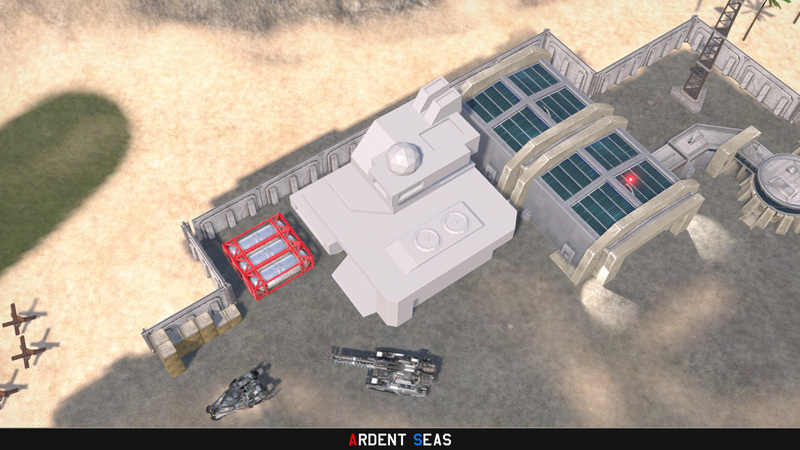 While Flagships can build some ships, act as refineries, build the most basic ground units, and do low-tier research, anything larger requires a base. The three factions build bases differently. The CN and Ravagers' bases aren't fully planned out yet, so I'm going to stick to the TDN for the most part, although we already have figured out how each faction does their base building. This is more of a general overview than a tutorial. The first 4 are fairly self-explanatory, being used to extract and refine the two main resources. The Vehicle Factory builds every available Ground Vehicle, the Small Shipyard builds everything up to Frigates and Destroyers, the Large Shipyard builds everything up to Cruisers and Battlecruisers, and the Airfield produces all available Aircraft, even those that can't fit on the Aircraft Carriers and Flagships. Now I'd like to go a bit more into detail about the build grid, and why we went with one in the first place, instead of free building. Now for the grid itself. 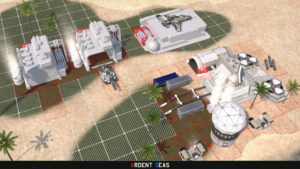 The build grid is projected over the terrain and water, white squares indicate open areas, while blocked areas are marked red. Reserved tiles are marked in blue - and are also blocked. When you place a building, you'll see a translucent hologram of the building, and a footprint. The footprint turns green when the area is clear for building, and yellow when the area is blocked. Resources extracted by extractors are transported from the extractor to the refinery by Skycranes, the TDN and CN share a common Skycrane, while the Ravagers will get their own. What isn't entirely clear yet is if the resources then also have to be transported from the Refinery to the Depot if the Refinery's own storage is full, and even the factories, or not. 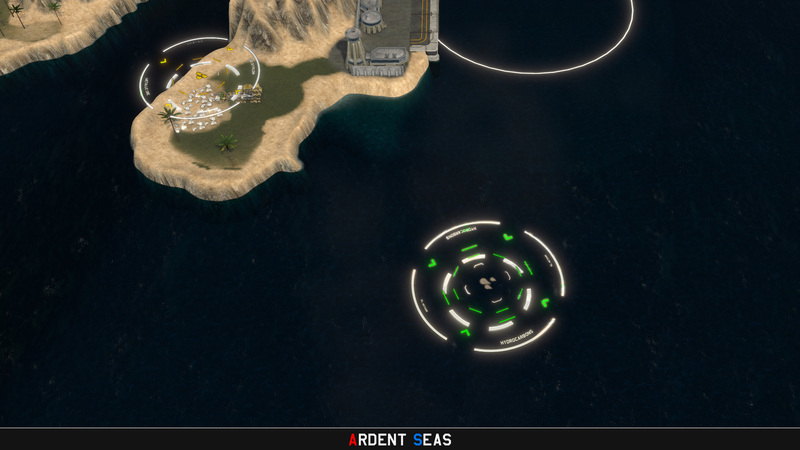 This might be interesting, but we don't want to drift too far into Anno 2070-territory. Prior to a refinery being built, the resources are brought to the Flagship. Naval building is overall similar to building on Land, with one important difference. 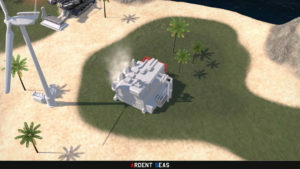 Mobile Command Posts can only be deployed on Land, so it's not possible to set up shop off the coast of an enemy player, that's what production cruisers, logistics support ships and the like are for. ApornasPlanet definitely still a thing. I should have my PC back in action in a couple of weeks, then I can get back to work. Tufted_titmouse Yes, but it's all behind the scenes, and not easy to show off. I'm currently not able to work on the game, but Koen continues to do his part. I hope to get back into it ASAP. How about infantry,it will be awesome to see them fighting alongside your ground forces and boarding ships. Infantry isn't currently planned, it would be a lot of work, for something that would barely see use. Any demo yet? Has this been release? could someone provide me info! No demo, and no release yet. We'll announce both here when the time comes!